Lighting-Gallery-net - good ol' mercury vapor/Feit 175w merc from late 80s/early 90s surprisingly better made than today's Feit mercs! Feit 175w merc from late 80s/early 90s surprisingly better made than today's Feit mercs! Why better made? First, has actual phosphor. Later ones are just diffuse coated. Second, arc tube is properly designed. The lamp plus a 1960s Jefferson HX 175w ballast measured at 200w on the Kill-a-watt. Unlike the later ones which are often way off and roasts ballasts. Very nice lamp. Feit really isn't what it used to be with these are they? Nice. I remember when Feit used to source from decent companies. Their fluorescents were Sylvania and judging by the ones at my work in the 90's, they were pretty long lived. I found this lamp has pretty big electrodes, and an odd looking large starting resistor. Pretty interesting lamp. Dave---I have one of these in the original clamshell carton, even that is well made! I used this lamp for 4 years at thee end of the driveway in a NEMA head, then took it out of service, and you would barely know it was ever used! The arc tube has almost ZERO discoloration, and warmed up nice and slow like a Lifeguard! The color is awesome, and the lamp is just awesome! She is "retired" now, and I actually paid a premium price for it at Guido's electrical store in Mechanicville NY back in 1987, paid $16.99 for it, and never regretted it, and it is now a nice part of my collection, and since I kept the box, with a simple blue and white Feit Electric mercury lamp nomenclature on it, it adds to the cool factor. The base is mechanically secured, and seems to be a good grade of yellow brass, with the big 'trash can' type bottom contact on an unglazed porcelain insulator. I feel these lamps could easily do 25 years plus, but mine will stay as-is---though I am putting the 175 merc fixture I had in use at ETC in my basement shop to enjoy mercury vapor lighting instead of fluorescent when the fancy strikes, and certainly could chuck my Feit in it periodically and bask in the glow! They are slightly crude, prolly hand made, but the quality of construction is nonetheless tip-top all the way! The frame is well made too! These are lovely lamps all the way, and if I came on a bunch of these lamps, I'd put some in service! I have a 1988 Feit Electric lamp catalog as well, and I liked their slogan---"I'd rather FEIT, than switch!" They made slightly crude lamps, but they all seemed to be primo quality then and I was gonna go all with them then they went to crap. My Feit 175 merc is with all my other good vintage mercs--funny how fast time goes by, eh? That lamp is certainly vintage now! Rick D.
Glad to have found this lamp. Interesting lamp, Dave. It's hard to imagine that Feit sourced better lamps from China twenty years ago than most major lamp manufacturer do nowadays! I wonder which company made such quality product. They must have had some external help from Europe or North America in order to have their lamp production in proper order. Seems most things were made better back in the 1980's & early 90's and now the goal is to make the product as cheaply as possible to maximize profit...give the customer as little as possible value for their money but try to fool the customer into thinking they are buying the same great product they used to have. 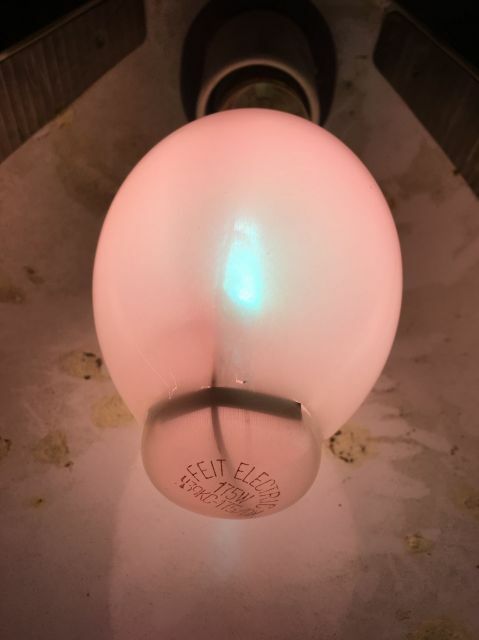 I do like the modern diffused, unphosphored Feit lamps though...it's cool to have the clear mercury color in a non-point source mercury lamp, but I wish they were made with proper arc tubes. I tested it a few more times, it indeed warms up like a lifeguard. Certainly slower than Philips mercury lamps. I had no idea different brands warmed up at different rates! I have a Chinese 'Westpointe' "175w" (really 125w) clear top lamp and while decently made compared to the big-3 lamps nowadays, I'm still not sure what I think of it. I'd like to find some of the diffuse Feit mercs myself. These old Feits are excellent. Like I said, wish I could find a few cases of these to enjoy. Also some clear versions. And yeah, Dave, they warm up like an old Westy Lifeguard does! I haven't seen mine lit since around 1989-'90 maybe, or '91,. cannot remember, but it is a thing of great beauty.